All transactions are safe and secure with a reliable history in online purchasing behind each of our associates. Buy the Don't Hassle Me I'm Loki shirt to own Thor clothing and merchandise. According to Norse mythology, Thor is the god of thunder and lightning. He is strong and powerful, while his adoptive brother Loki is on the smaller side. 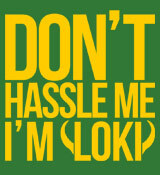 This Don't Hassle Me I'm Loki shirt was inspired by the t-shirt from the movie What About Bob? Encourage others not to bother you in this fun Loki design or snag some other Marvel Thor shirts now and bring on the lightning. He'll provide the thunder. In addition to the Don't Hassle Me I'm Loki tee above, browse the Thor Clothing Gallery for more apparel like men's and women's clothes, kids shirts or hoodies.